Not content with one leaving party already, Tash is having another celebration in London this weekend with all her friends, in the form of a big picnic in a park. I offered to bring a few bits and pieces (and then Chris requested the asian salad and some ribs we made at the party last weekend too! ), but mostly cake. I made a Dorset pear cake, and a summer fruit crumble cake, the recipe for which I am sharing with you today. The pear cake is my secret though – it’s just too good to share! I am kidding of course, I shall let you have it another day. For today, it’s the crumble cake’s turn to shine. 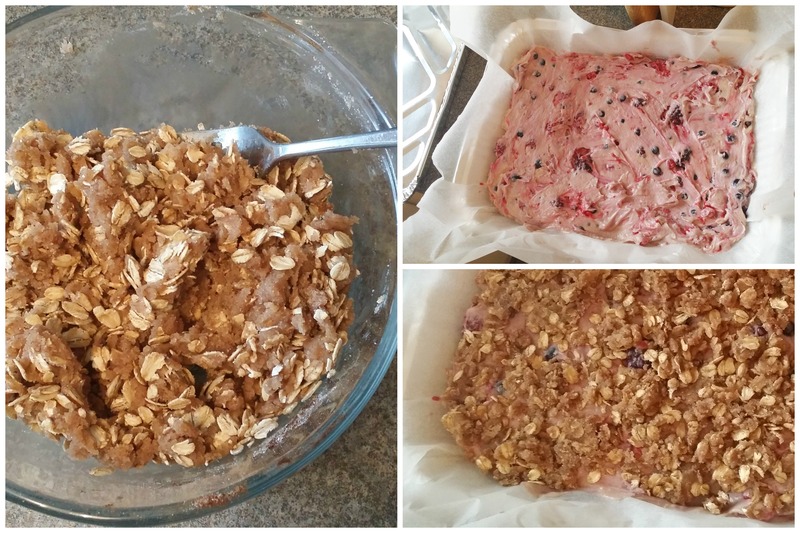 You may remember my rhubarb crumble cake a couple of months back, but alas there is no more rhubarb, and in the summer it’s nice to make use of the abundant berries that are around. I used a mix of raspberries, blackcurrants, redcurrants and strawberries, but you can use whatever fruit you have to hand – it is also lovely made with just blueberries, or in season, it is absolutely delicious with blackberries, with the added bonus of course that you can often get your hands on those for free. Preheat oven to 170°C, and grease and line a rectangular baking tin (9″x13″) with baking parchment, leaving some over the edges to lift the cake out. 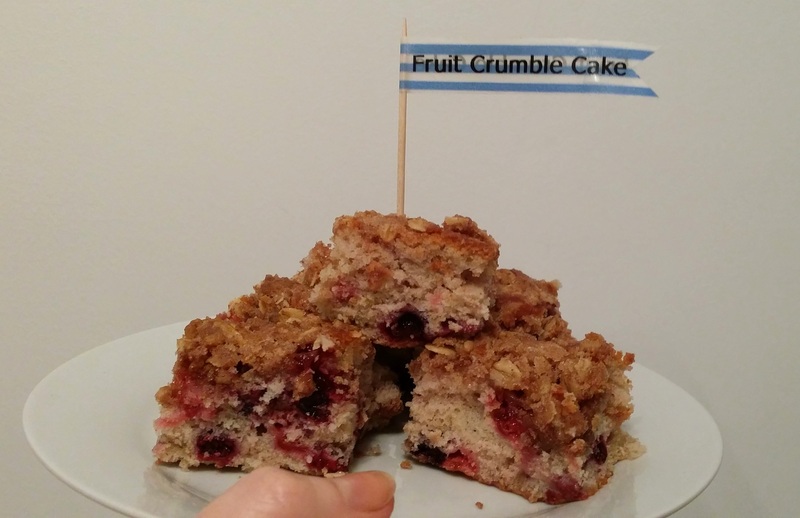 Prepare the crumble topping by adding all the ingredients to a bowl, and mashing with a fork until the ingredients are thoroughly mixed. It will seem too buttery, rather than crumbly, but don’t worry, it crisps up beautifully in the oven! Sift the flour, baking powder and salt into a bowl. In another bowl, beat the butter and sugar together, and then add the egg and vanilla extract. Then gradually add the liquid ingredients to the dry, along with a little of the milk at a time, until just combined. Fold summer fruits into the mix. It will be very stiff at this stage, and difficult to spread around the pan. This is how it should be! Once you have spread all the mixture evenly around the tin, scatter small lumps of the crumble all over the top to cover evenly. Put the cake into the oven for 40-50 minutes, checking after 40 with a skewer. If the end comes out clean, it’s done. Set on a cooling rack to cool completely, then lift the cake out and slice into squares. Enjoy with a cup of tea, or on a picnic with friends! I love how pretty the batter looks before it goes into the oven, all pink and swirly. Happily it is just as lovely when it comes out – a marble of purples, pinks and creams, with a yummy crunchy topping. Since there will be a lot of food at the picnic I thought it would be easier for everyone if they could see at a glance what something was, so I recycled the toothpick I used to check whether the cake was baked or not into a little marker. I added a washi tape flag, and then printed the name on my Dymo label maker for both the front and back of the flag. I used black text on a clear background, so you could see the pretty washi tape colours through the flag. I didn’t have any plain coloured tape, which I think might have made the writing easier to read, but I think it looks cute with the stripes. Why not take some along to the next picnic or garden party you have planned this summer? I’m cheating by bringing it to not one, but two parties – my little sister’s and today’s blog party Fiesta Friday over at the Novice Gardener! This week Angie is joined by Antipodean co-hosts Saucy and Margot in making sure we all have a great time. Hope you enjoy the cake everyone! I could do with a nice piece of that right now. Thanks for sharing it with us at Fiesta Friday. I’ll second that, would love a piece now. It looks so good! Thanks guys. I am peckish and it is pretty hard knowing that my kitchen currently has 4 tins full of cake…and nobody knows how many bits, so wouldn’t know if one got eaten….! Argh! Must resist! Will eat plenty tomorrow! Looks awesome, Anna. 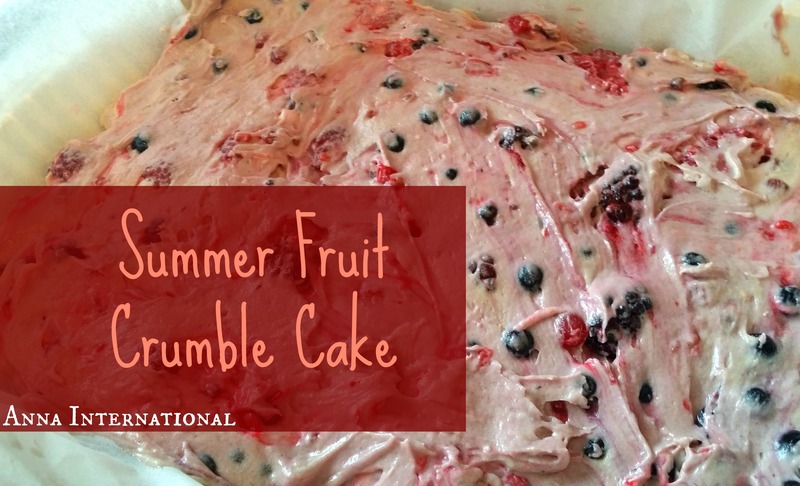 I love fruity desserts in summer and this looks perfect to share at a picnic. Thanks! Let’s hope I made enough of it!! I agree, and thank goodness! Too delicious not to be! Great looking cake, Anna! I’m really impressed that you also made a cute-as label for the cake. Do you want to come to our next picnic?? It looks like the FF crowd is loving this cake, so I’m glad I got a slice! Hope you are enjoying the party this week!! And to you Sadia! Thanks! I hope there’s still something left for me. 😀 This cake looks really good. Lovely cake! Would make for a great accompaniment with tea. I can attest that it does!